Hi everyone! 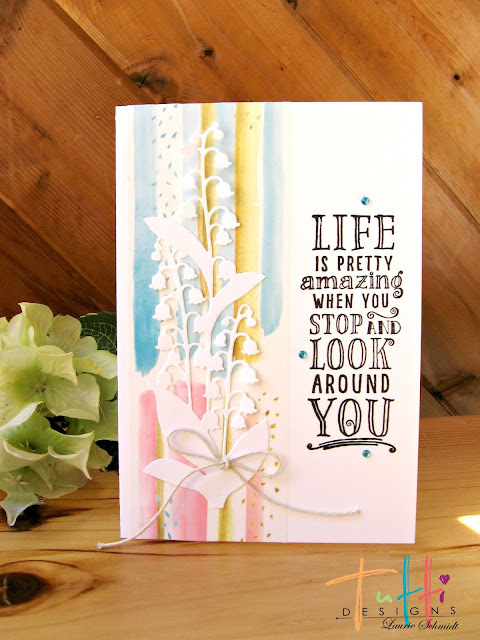 Laurie here from Stamping Up North sharing an EASY Clean and Simple card I made with Tutti Designs Lilly of the Valley panel. First I stamped the sentiment onto the card in black, then I added some very wide washi tape on the other side. I cut out the lily panel and cut the lilies apart. I made an arrangement and gathered it with a twine bow. Then I adhered that onto the washi tape, and added some tiny jewels around the sentiment. Clean,simple and SO easy!! I love Lily of the Valley ... this is so, so pretty! Great job Laurie! Oh! I knew it looked different... love how you cut it away from the border. And that's Washi tape? Sooooo beautiful!